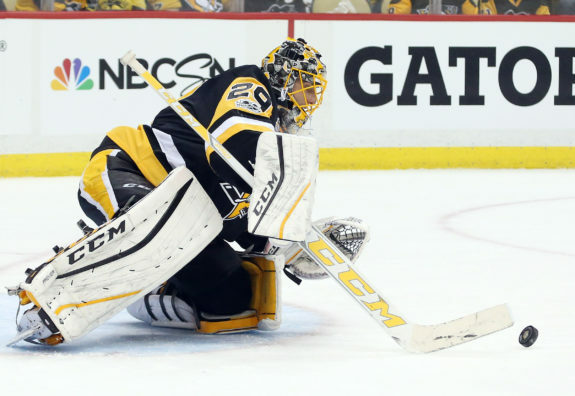 After Matt Murray led the Pittsburgh Penguins to the Stanley Cup last June, trade rumors immediately began circling for Marc-Andre Fleury. Especially with the expansion draft a year away, many assumed Fleury would be dealt before the season even began. 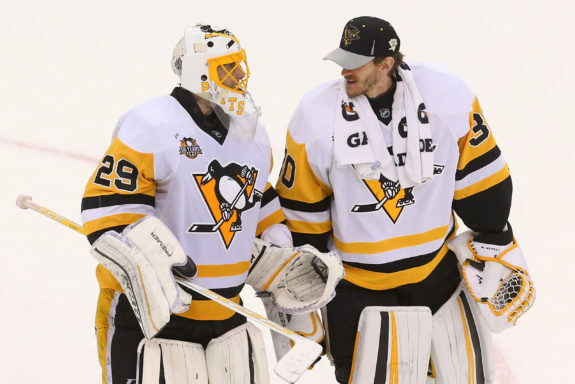 Penguins general manager Jim Rutherford may have dangled his veteran goaltender in front of some teams last summer, but no deal was ever made. Heading into the season, Rutherford valued Fleury’s experience and how important that could be to teaching Murray how to be a pro. Despite leading Pittsburgh to the Stanley Cup, Murray still had just 13 regular season NHL games of experience prior to October. Although having both goaltenders didn’t initially yield the results Rutherford hoped, it’s certainly paid off this postseason. Once Murray healed from a broken hand he sustained during the World Cup, he and Fleury split the Pittsburgh net pretty evenly. From the beginning of November to the middle of January, the Penguins won a lot of games, but it wasn’t because of stellar goaltending. In 21 games during that stretch, Murray posted a .916 save percentage and 2.53 goals-against average. Even though those numbers aren’t terrible, he was much better last postseason with a .923 save percentage and 2.08 GAA. Meanwhile, Fleury was even worse over that time, recording a .904 save percentage and 3.23 GAA. Neither could find a rhythm, and it was beginning to be a problem. Recognizing the issue, head coach Mike Sullivan made Murray his No. 1 starting goaltender in the middle of January. Whether it was that belief or not receiving the right offer for the veteran, Fleury remained with Pittsburgh after the trade deadline. He then was the superior goaltender in March, posting a .931 save percentage that month. Murray hit a little bit of a slump at that time, submitting a .910 save percentage in 10 starts during March. Then, Murray suffered a lower-body injury in early April and aggravated the injury during warm ups of Game 1 in the first round. There was nothing to worry about, though, because a pretty hot Fleury was waiting in the wings. The 32-year-old was spectacular versus the Columbus Blue Jackets, as he made at least 31 saves in four of the five games. In the series, he posted a .933 save percentage. That dropped to .921 versus the Washington Capitals in the next series, but Fleury was arguably even more important in the second round. The Penguins were outshot in every game, so they relied very heavily on strong goaltending. Fleury didn’t disappoint and ended the series with a Game 7 shutout. The veteran goaltender earned another shutout in Game 2 of the Eastern Conference Final before giving way to Murray during a poor Game 3. Fleury isn’t in line to win MVP anymore, but without his strong play in the first two series’, the Penguins’ repeat bid would have ended a long time ago. It was controversial to hand Murray back the starting job prior to the Eastern Conference Final Game 4; now with the benefit of hindsight, it was absolutely the right decision. The Penguins responded the proper way to the switch and scored an average of 3.5 goals per game in the final four contests versus the Ottawa Senators. Of course, Murray has been great too. He is 5-1 with a .943 save percentage and 1.54 GAA since entering Game 3 against the Senators. He’s really only had one poor showing — Game 1 of the Stanley Cup Final versus the Nashville Predators, but due to some really strange events, the Penguins still won. Then, Murray responded by stopping 37 of 38 to lead Pittsburgh to a Game 2 victory. Matt Murray was unbelievable tonight. Slowed the game down when the Penguins needed. Great pulse on the game. What a performance. The Fleury versus Murray debate will likely rage on in the Steel City for years even after one of them leaves (it’s going to be Fleury this offseason). But as the Penguins sit two wins away from repeating, it’s never been clearer that Rutherford’s plan of possessing two No. 1 goaltenders was absolutely necessary for Pittsburgh to win this season.